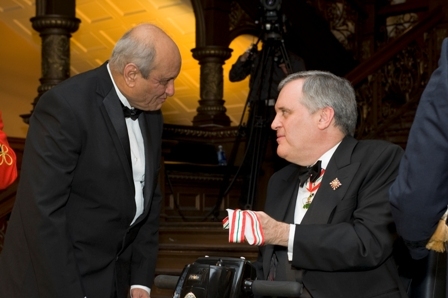 Mr. Mobeen Khaja was appointed to the Order of Ontario in a ceremony that took place on January 27, 2011, at Queen's Park. He was among 30 recipients who were chosen for their contributions to arts, justice, science, medicine, history, politics, philanthropy, community service and the environment. He was recognized for "his contributions to promoting peace and cross-cultural understanding between Muslims and other religious and ethnic groups. He founded the Association of Progressive Muslims of Ontario and Canada ". The following citation was read when he was presented with medal by the Lieutenant Governor of Ontario, the Honourable David C. Onley. "For more than half the 36 years he has been in Canada, Mobeenuddin Khaja has actively promoted peace and cross-cultural understanding between Muslims and other religious and ethnic groups. He founded the Association of Progressive Muslims of Canada and the Association of Progressive Muslims of Ontario. Every Eid, these organizations unify Muslims and others in simultaneous celebrations in Ottawa ,Ontario and the City of Toronto. Believing that religious intolerance negatively affects us all, Mr. Khaja has worked with churches, the police, tourism officials, governments, schools and communities to find ways to break down cultural stereotypes and misconceptions and replace them with understanding. Mr. Khaja’s work is representative of a Canadian society that celebrates diversity".